Above: Rosemary Cathcart, owner and proprietor of Sheelin Lace. 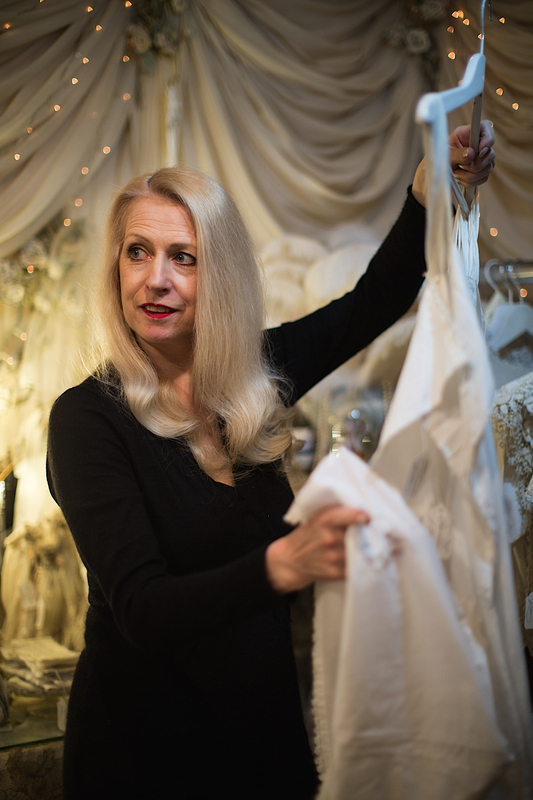 Pursuing her life long passion for Irish Lace, Rosemary Cathcart started collecting her first vintage pieces in her early twenties when she was just starting a family. About twenty years later in 1998, she had collected enough to start selling as well as putting key pieces on permanent display and opened the Sheelin Lace Shop and Museum in Northern Ireland in the village of Bellannaleck — the same village where she met her husband Malcolm of 38 years and where they raised their five children. In 2013, she opened her London shop in Alfie’s Antique market, which is run by her daughter Caroline. 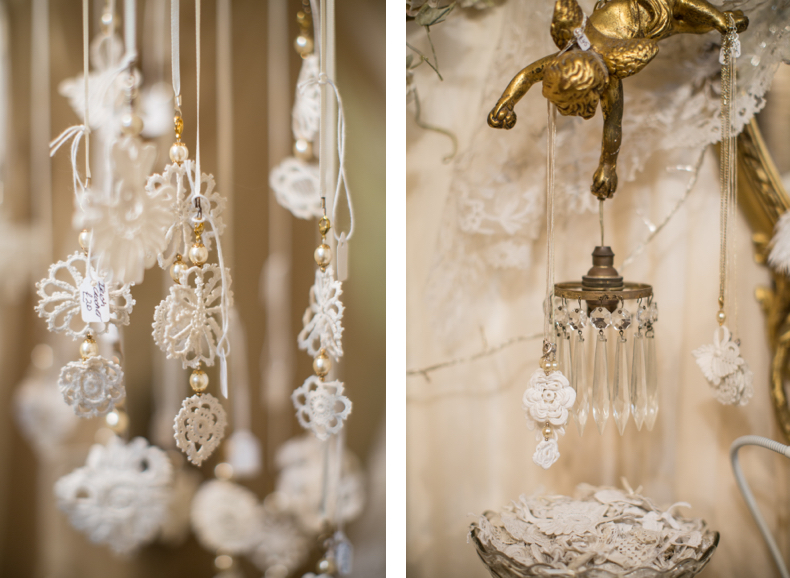 Forever a passionate advocate for the beauty of lace, Rosemary also brings her creative talent to the re-purposing of vintage lace and pearls into jewelry and head pieces. Ever since Queen Victoria chose to wear a lace-trimmed white gown as her wedding dress when she married Prince Albert in 1840, lace has conjured romance and brides. If everyday is Galentine’s Day at Fabulous Fabsters, I propose that Valentine’s Day belongs to Rosemary and Sheelin Lace and would like to thank her for sharing her story below. 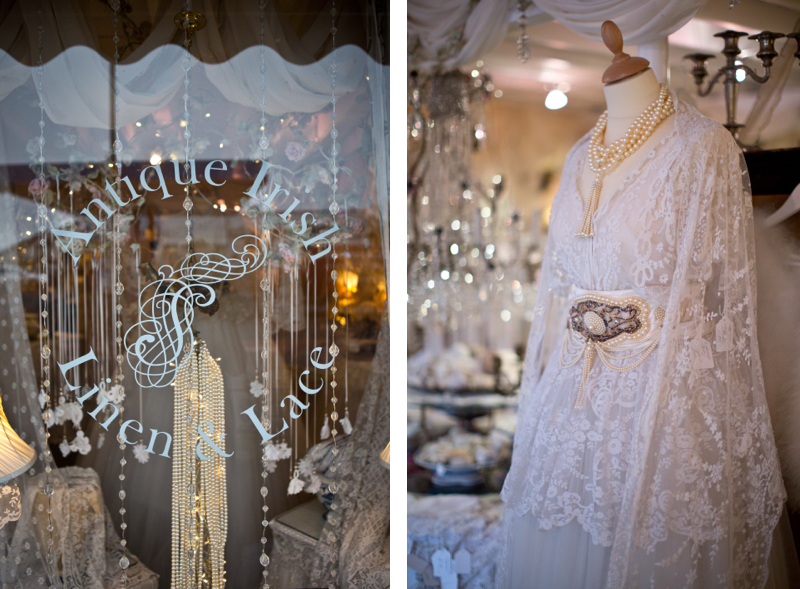 Above L: The shop window of Sheelin Lace. Above R: An appliqué lace wedding shawl, which would have been worn around the bride’s shoulders, is accessorised with Rosemary’s own creations. The necklace is made from vintage pearls and the cummerbund has a front panel of vintage pearls and beading. FF – How did you become interested in lace? RC – I have always been interested in needle work as my mother was always sewing and made me lots of outfits when I was a little girl. She was also a marvelous knitter and loved to crochet so I was surrounded by beautiful needlework items from a young age. We also had sewing classes in primary school which I loved. I found my first piece of antique lace at a fair when I was about 20. It was a silk bobbin lace piece and I have been collecting ever since. FF – What made you want to turn your passion for lace into a business? 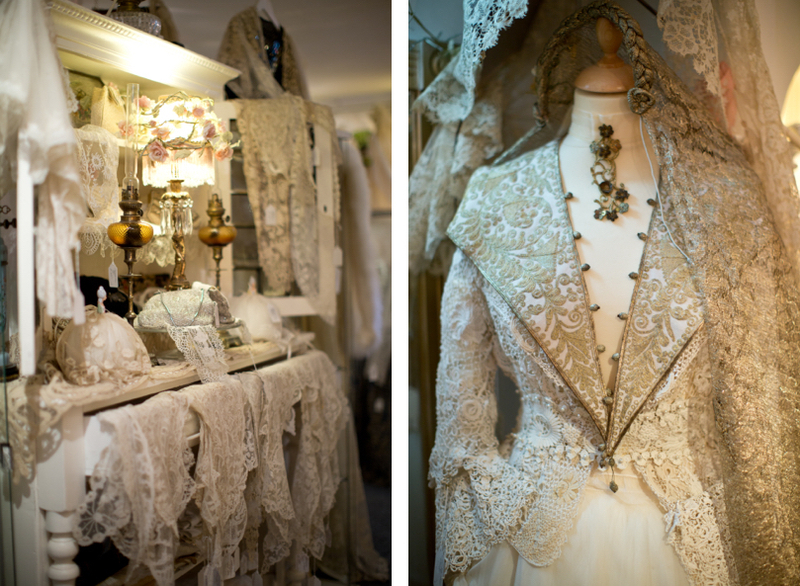 I found it very surprising that there where very few places in the whole of Ireland to buy or view antique Irish laces. It’s such an important part of our history — at one time thousands of women in this country were lace makers. I started to buy my pieces from antique textile auctions where you could acquire really fabulous examples of this amazing art. I knew that eventually you just wouldn’t be able to find pieces of museum quality so I think I started collecting at the right time as it’s really getting much harder to find today. 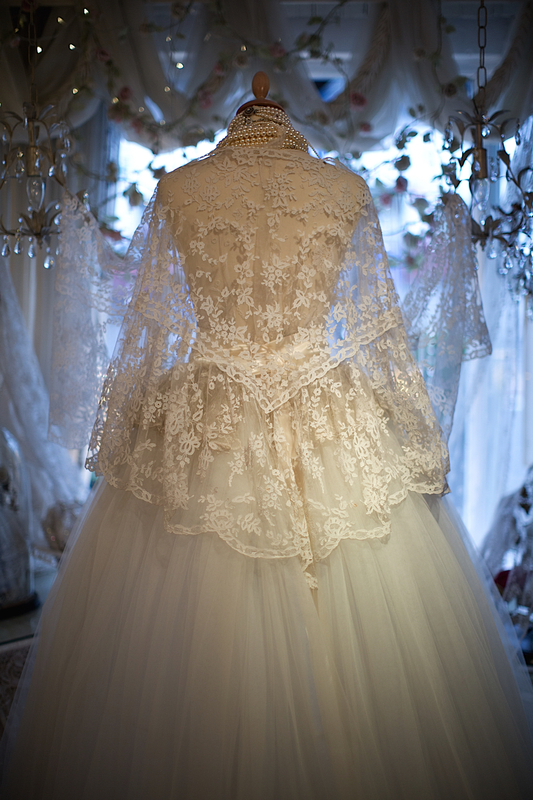 Once my collection was large enough I decided to have a museum where I could have the lace items on permanent display and also a shop where people could purchase beautiful examples of antique Irish lace such as wedding veils, gowns and accessories. Above: This Edwardian blouse would probably have been part of a wedding gown with a matching skirt. It has panels of Irish crochet as wells as crochet buttons. FF – What more can you tell us about Irish lace and its makers? RC – The laces I sell are all Irish Laces and date from around 1880-1900. At this time there was a very large lace industry in Ireland and there were lace schools all over Ireland where the women would be taught to make lace by someone who would have qualified in lace pattern drawing and lace making. Above L: The exterior of Sheelin Lace Shop and Museum. 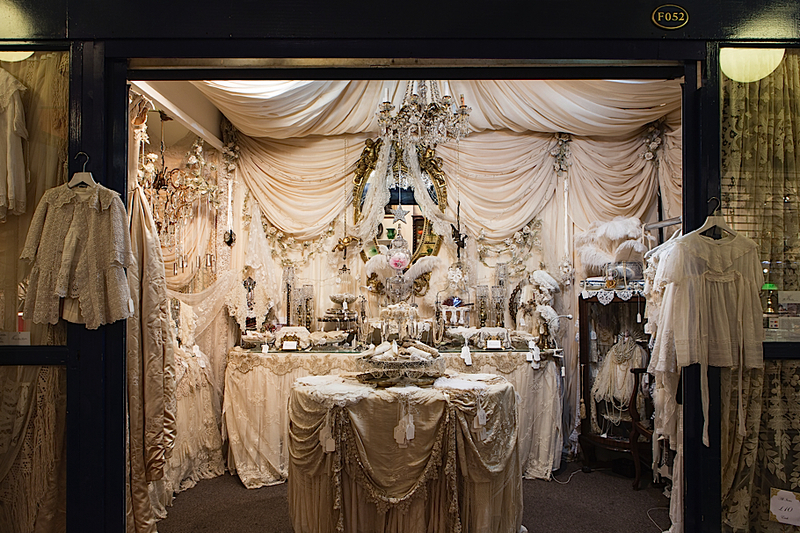 Above R: With their lace drapes, chandeliers, pearls and vintage jewels, the décor of Rosemary’s shops channel the private intimacy of a boudoir. FF – Where is the name Sheelin Lace from? 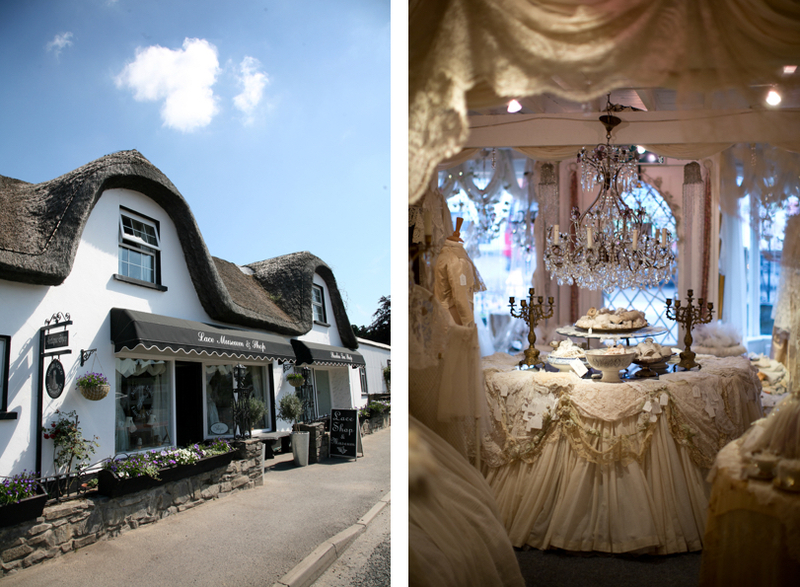 RC – Sheelin lace is the name of my shop it comes from the name of the building where the shop and museum are housed. This building and our village holds many memories for us. When I first got married my husband’s family had a restaurant in this building and we ran it for a few years. Then as the family grew, we bought a farm and kept sheep and grew vegetables. Our five children loved growing up on the farm. Eventually when they grew older, we sold the farm and bought the village shop and post office which we still run. Above L: A display of lace pieces. 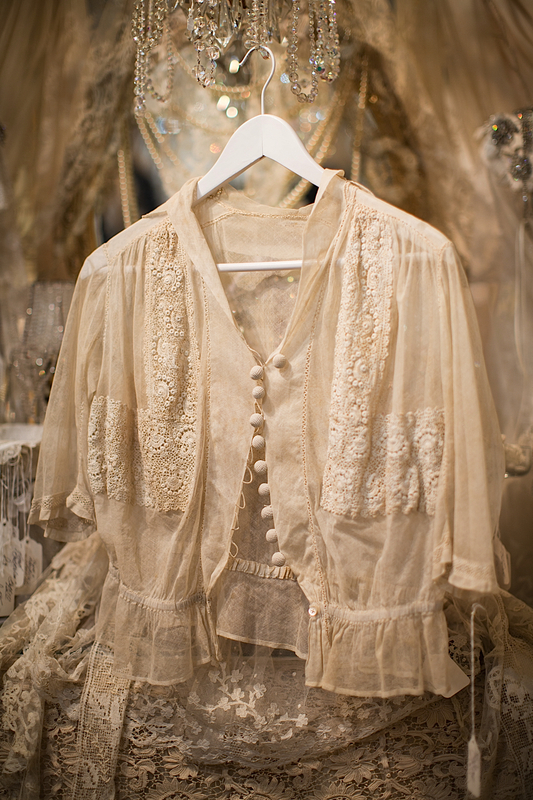 Above R: A gold collar and matching rare gold lace veil is draped over an Irish crochet jacket with lace cuffs. FF – Who are your customers and why are they interested in lace? RC – I sell lace to people from all over the world. Some are lace collectors and others are buying for their wedding day or maybe a piece to frame just because it’s a beautiful work of art. 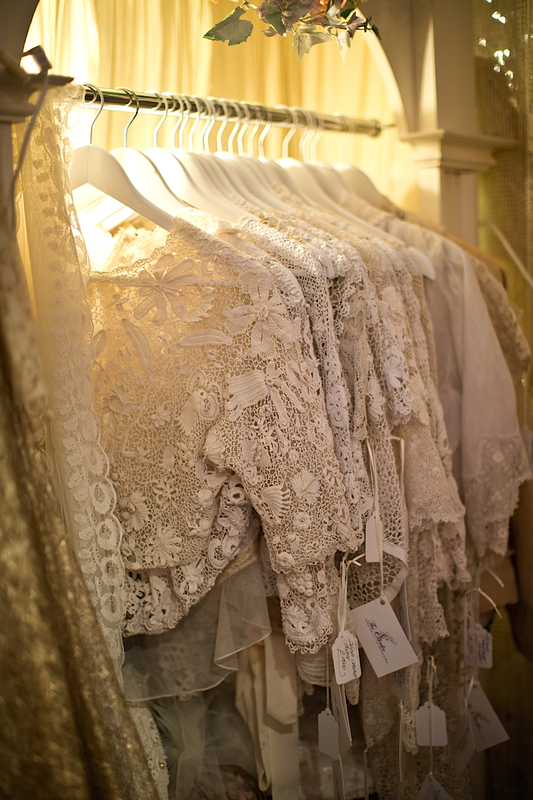 Above: The Sheelin Lace concession at Alfie’s Antique Market in London. FF – What was the impetus for opening a concession at Alfie’s Antique Market in London? RC- I love London and was going down regularly to see my two daughters who live there. Caroline now runs the lace shop in Alfie’s and Helen who is a professional photographer and does all the images for my website. I realised that my shop would fit in really well at Alfie’s. One day, I look forward to having a larger shop in London. Above L & R: Necklaces made by Rosemary from antique Irish crochet flowers and vintage pearls hover in the air delicately like snowflakes. Above: An intricate headpiece is made from large antique crochet flowers with vintage Diamante jewels woven in. 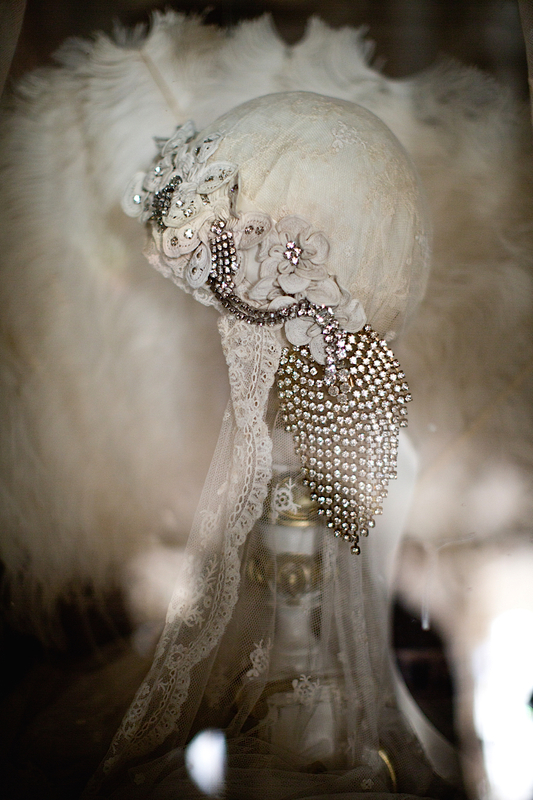 The headpiece is assembled with a velvet band and can be worn with (as pictured here) or without a veil. FF – What’s the best part about your job? RC – My favourite part of having my shops is making necklaces and head pieces to sell. I make them using antique lace flowers from my collection and adding vintage diamanté jewels. It’s lovely creating something from original antique pieces because they are really beautiful and no two pieces are the same. Above: An appliqué wedding shawl is draped over a wedding dress. RC – Lace always seems to be in fashion. After the last royal wedding, all the brides were looking for gowns with a lace bodice and long lace sleeves which is so much nicer than the gowns with no shoulder or arm cover. 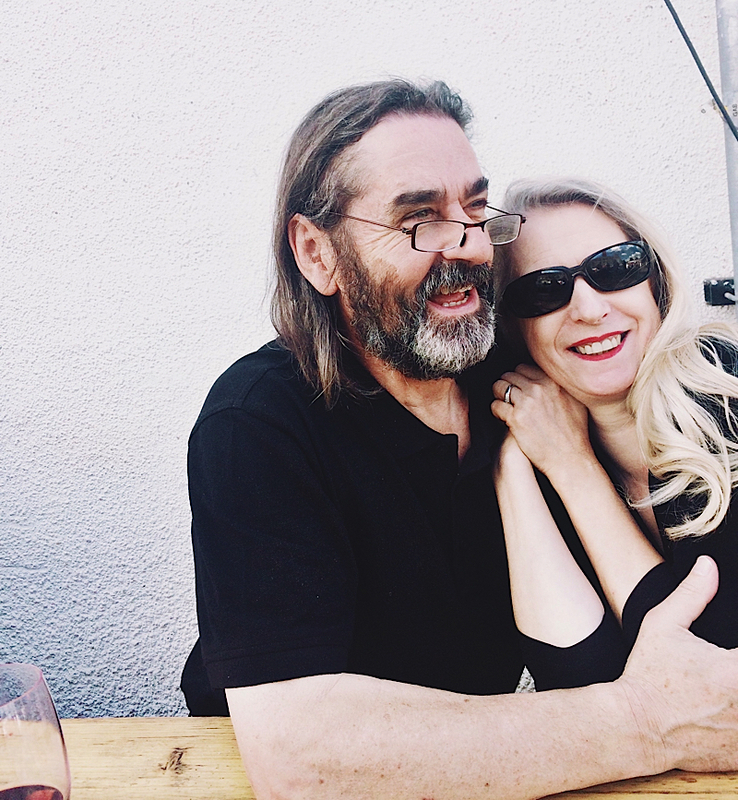 Above: Rosemary and her husband of thirty-eight years, Malcolm Cathcart. For their Lace Anniversary (thirteen years), he bought her an antique Irish crochet lace tablecloth. Rumour has it that Rosemary never goes down to London for too long because she and Malcolm find it difficult to be away from each other. RC – Fresh fruit and vegetables — I am lucky to have lots of winter winter greens in our garden. Above L: The entry hall to the Cathcart’s home. 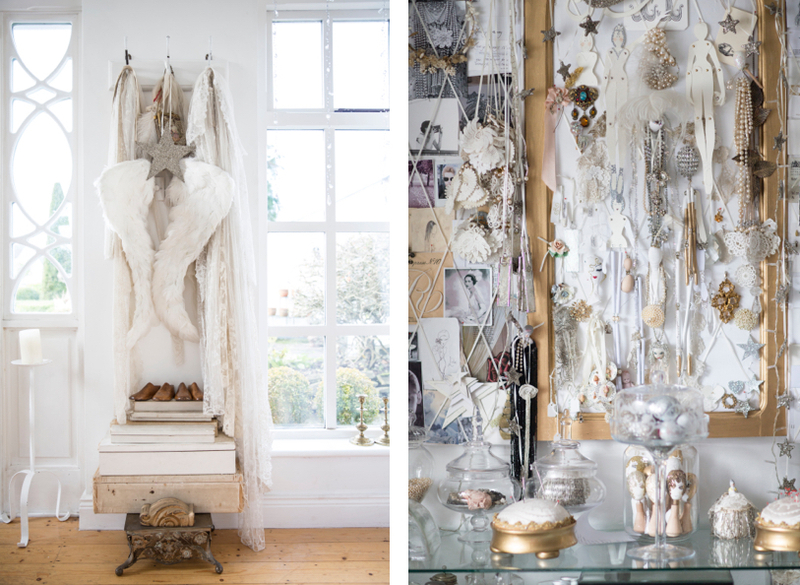 Above R: Rosemary’s workshop at home where she designs and makes her lace necklaces and head pieces. FF – How do you stay strong and stay well in body and mind? RC – I think you stay strong and well when you are doing something you have been interested in and loved your whole life. You can’t really call it work then. 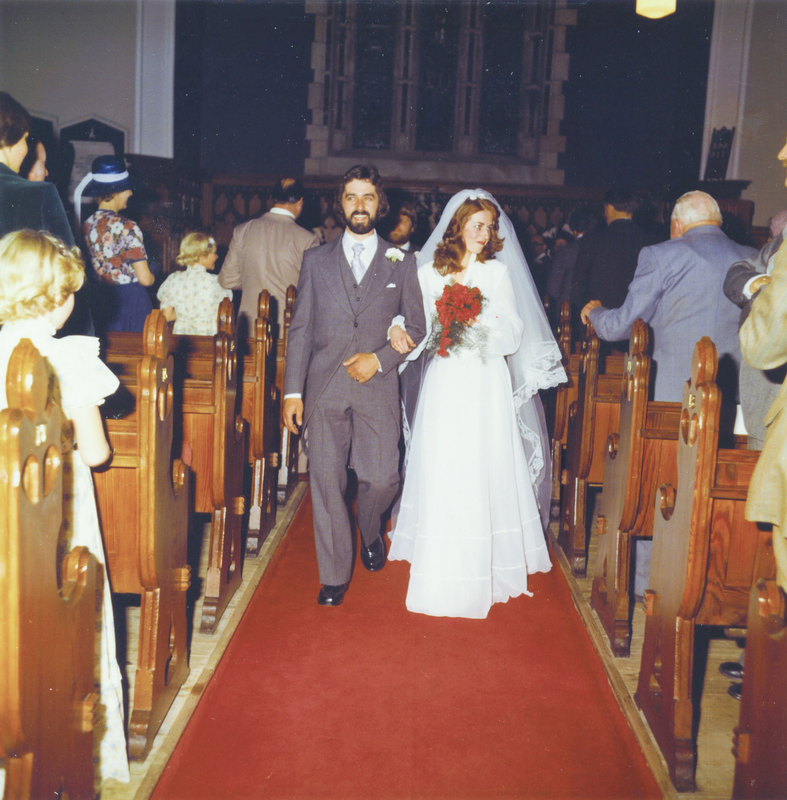 Above: Rosemary and Malcolm Cathcart on their wedding day in August, 1978. FF – Please indulge the romantic side in all of us and tell us how you met your husband, Malcolm. RC – I was working in the hotel in the village were my husband’s family owned the village shop. He was delivering some items to the hotel one night and it was snowing outside. He walked into the lobby with snowflakes in his eye lashes and it was love at first sight. All photographs excluding the one of Rosemary and Malcolm walking down the aisle together, were taken by their daughter, Helen Cathcart, a London photographer who is also the co-curator of Bolder — How to Grow Older. Above: Lace and snowflakes. Artwork by Christine Chang Hanway. A Fabulous Fabster thank you to Rosemary Cathcart!